The editor behind a front page which promised more devolved powers for Scotland should its people vote against independence says he is now in favour of a breakaway from the United Kingdom. Former Daily Record editor Murray Foote has come out in support of Scotland going it alone, saying Brexit has changed his mind on the issue. 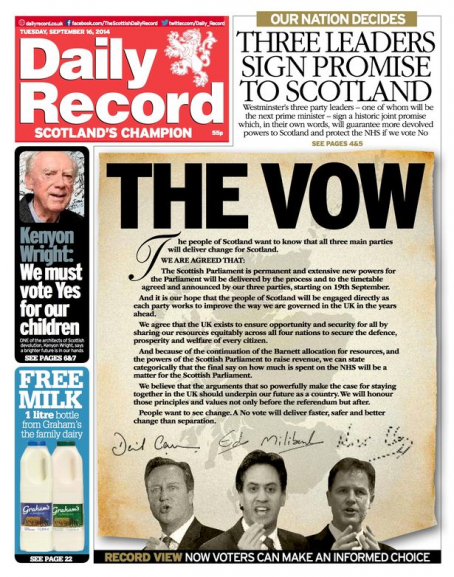 Two days before the vote in September 2014, the Glasgow-based Record ran its award-winning ‘The Vow’ splash – which featured a pledge signed by David Cameron, Ed Miliband and Nick Clegg promising the Conservatives, Labour and the Liberal Democrats would “guarantee” more devolved powers to Edinburgh in the wake of a ‘No’ vote. The design won the Record the Front Page of the Year prize at the 2014 Scottish Press Awards. But Murray, who left the daily newspaper earlier this year, has now backed the idea of an independent Scotland. In a piece for The Times, he said the UK government had show “blatant contempt” for devolution by refusing to properly debate the EU Withdrawal Bill. Wrote Murray: “I can no longer stand by while a cabal of the privileged deprive our sons and daughters the right to live in 27 European countries because they don’t like Johnnie Foreigner encroaching their elite club. He added: “The difficult decisions our independent nation would face and the sacrifices we may need to make do trouble me. But what troubles me more is the prospect of bequeathing to my daughters an isolated Britain governed indefinitely by the progeny of Rees-Mogg and their ilk. Well said Murray, more power to your arm.